The bone covering (anterior to) the knee joint. The bones of the foot and hand that form the toes and fingers. 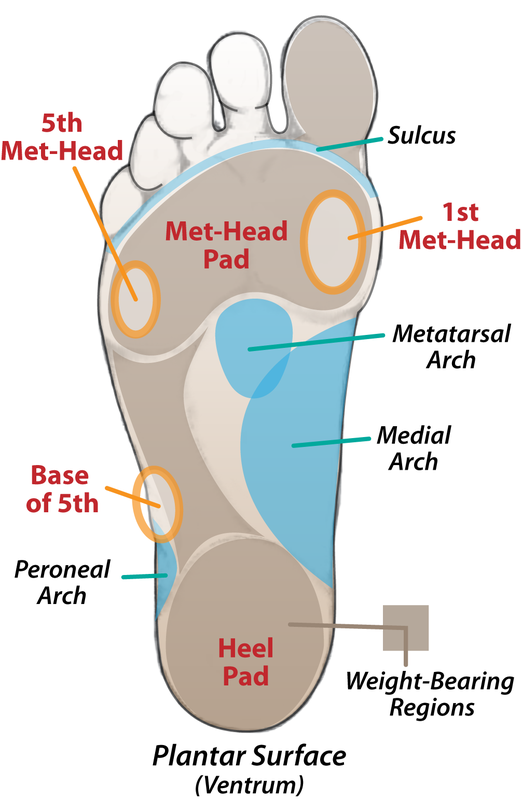 Relating to the bottom surface of the foot (same as: sole). Term used to denote movement or positioning of the foot or toes downward (toward the plantar surface) or the movement of the leg farther away from the top of the foot (weight bearing). A small cavity or depression. To support one side of the forefoot in a raised position (not in direct contact with the floor) by placing a dense foam material between the bottom of the brace and the floor. Term used to denote position on or towards the back surface of the body. Excessive use of the medial side of the foot for support and/or ambulation. Typically presents with valgus heel, collapsed medial arch and forefoot abduction. To keep or maintain a foot or leg shape or alignment as it was cast. Term used to denote position closer to the origin or root of an appendage (example: The knee is proximal to the foot). A description of volume indicating greater than normal thickness or width due to the presence of extra body fat (same as: fat; chubby; flabby). To extend the elongation of the dorsal plastic during the wrapping process so as to make the dorsum of the brace thinner.